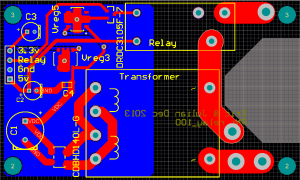 At the same as working on the nRF24L01+ PCB, I’ve been progressing on another project. I picked up a 30/m addressable LED strip from Macetech. These LED strips are comprised of the WS2812 tricolor LED and controller package. 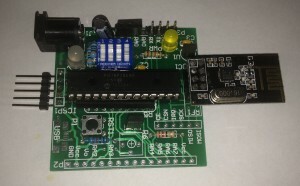 The WS2812 contains a red, green, and blue LED and a controller complete with a single line data interface and 3 PWM modules for running each of the LEDs individually at independent brightnesses. Furthermore, the controller is set up so that it can transmit signals to the next WS2812 in the strip so that these modules can be daisy chained. 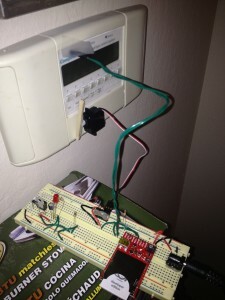 When put together into an LED strip, a microcontroller can simply provide power, ground, and a single line of data to control the entire strip. 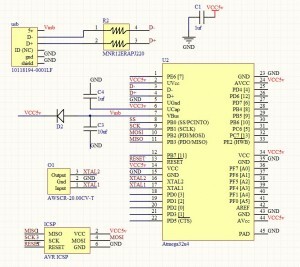 To populate the LED strip, a series of bytes is sent to the first LED. Once 3 bytes are sent (the color definition for one LED) the next byte causes the first color to be “pushed” on to the next LED. When the entire strip is populated, sending a reset signal causes each LED to display the color that it ends up with. Sending a byte to the WS2812 requires 8 transitions on the data line each spanning 1.25 microseconds for a total of 10 microseconds per byte. Unfortunately, using a PIC18F25k80, this timing requirement allows for about 20 processor cycles for each bit transition. This is is a pretty tight requirement and I was unable to make it with my C compiler. Instead I ended up writing a method in assembly to get the timing I needed. It took awhile to get it right and it still has some minor bugs, but it was an interesting exercise. 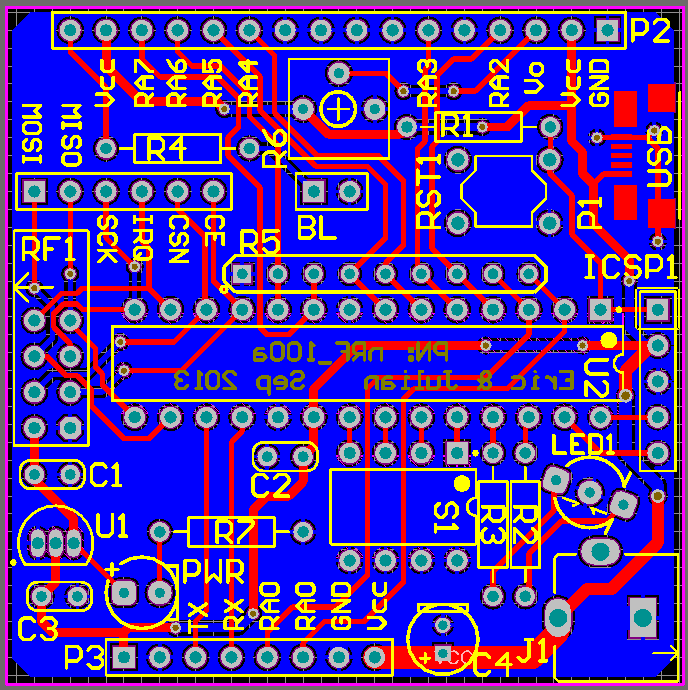 After getting the code working on the nRF board that I previously blogged about, I designed a new PCB to better fit my requirements in a smaller package. This time I used primarily surface mount parts in significantly smaller packages. 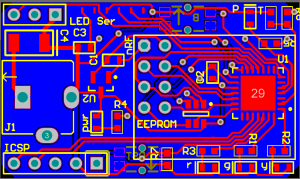 Here is the final PCB design and the populated board. Remarkably, this board seemed to work flawlessly the first time around. 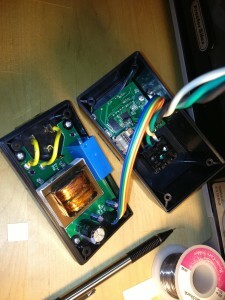 Both the nRF module and the LEDs worked exactly as expected. One additional piece of progress made with this board was our first successful use of reflow soldering to populate the board. Reflow soldering uses solder paste instead of traditional solder which is viscous at room temperature. 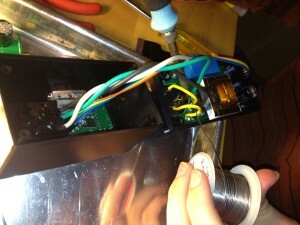 To solder a board, solder paste is applied to all of the pads and then components are placed in the sticky paste. Once prepared, the board is simply baked to just over 180° C which causes the paste to fuse to the contacts and turn into solder, thus soldering your entire board in moments. I’ve continued writing code for this board and have a simple proof of concept that lights the strip in some demo patterns during until it receives a packet on the wireless module. At that point, the LED strip is under remote control. Packets consist of an starting index, a length, and the payload that is copied into the LED buffer and then displayed to the LED strip. 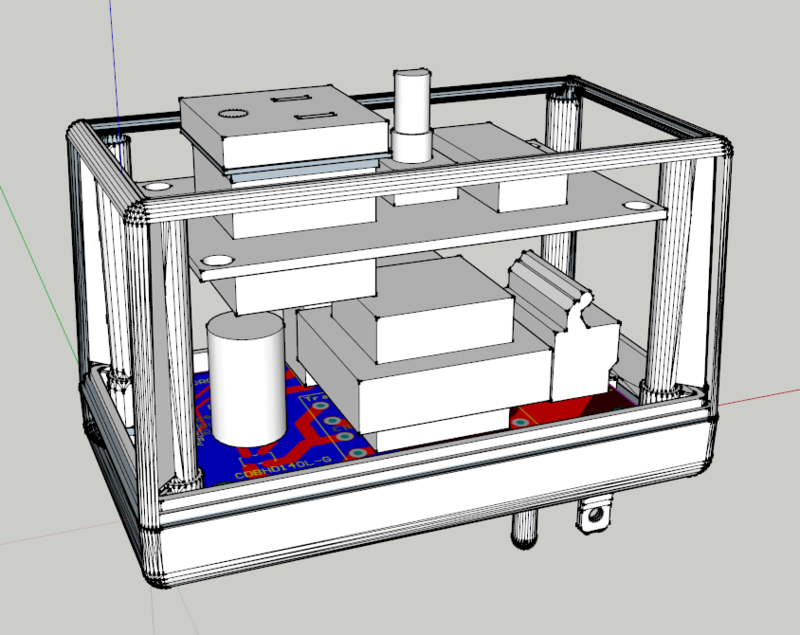 The next step in this project is to design a new board, probably using an Atmega microcontroller that will fit into a case sold by Polycase. 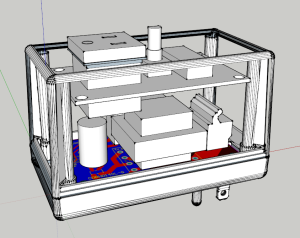 Getting a PCB and components to fit into a case is a new hurdle that has involved a significant amount of 3D modeling in SketchUp as well as extra spacial considerations such as switching to a flatter power jack. It’s been awhile since I’ve posted anything, but I’ve been anything but boring the past few months. 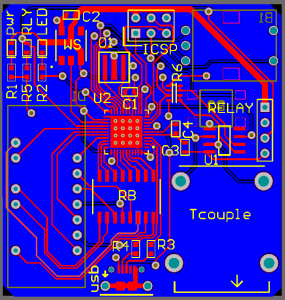 After hacking out the Hot Tub Remote project, I moved on to tinkering around with a PIC18F25K80. This PIC is a a very reasonable middle of the road processor. At 16Mips and 32K of program memory it has enough power for fairly ambitious projects. 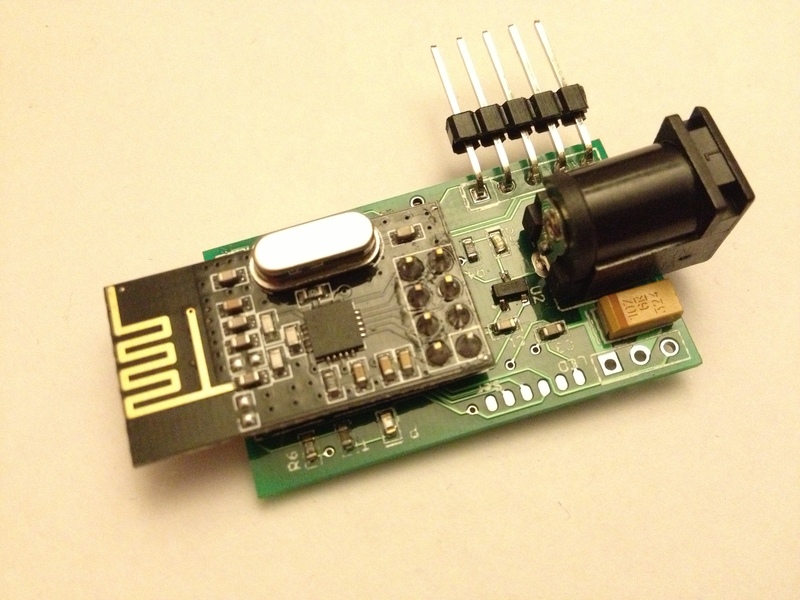 Eric and I spent a decent amount of time and a few iterations to streamline the interaction between this PIC and the nRF24L01+. The nRF24L01 is a cheap and easy little wireless module that communicates in the 2.4GHZ frequency range. 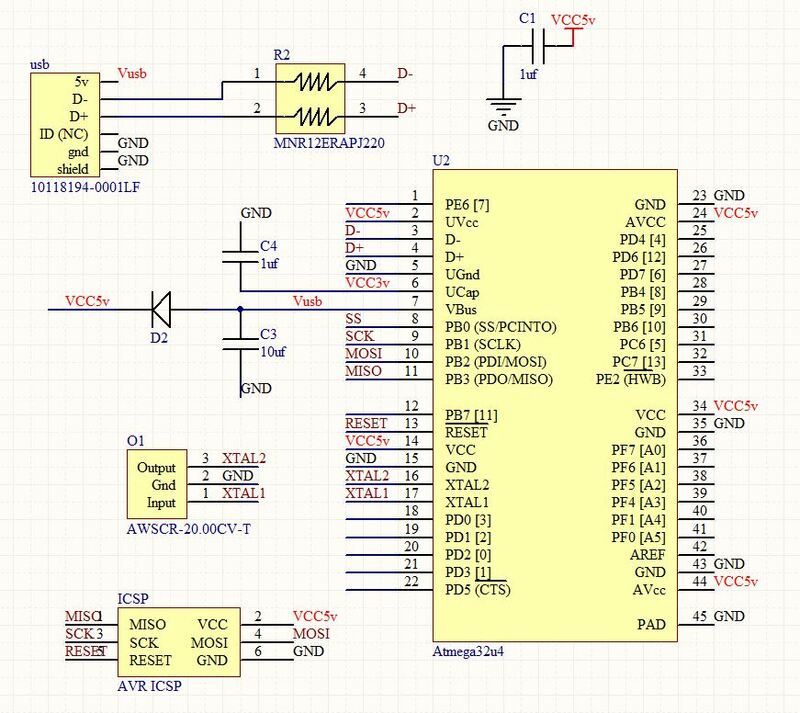 After breadboarding out a communicating pair of nRFs and spending a few weeks cleaning up, streamlining, and fine tuning our communication library, we started designing a PCB to make working with this module easier. Eric did most of the work on this board and here is what the final board looked like. We shipped this board off to our Seeed Studio to be printed and received the boards and parts in the mail a few weeks later. 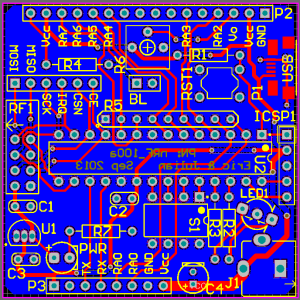 For this board, we carefully avoided any surface mount soldering (with the exception of the mini USB solder pads) in order to make populating the boards easier. The headers are optional and can be populated on a per-board basis depending on our needs. We ended up building out a total of 5 or so of these boards. 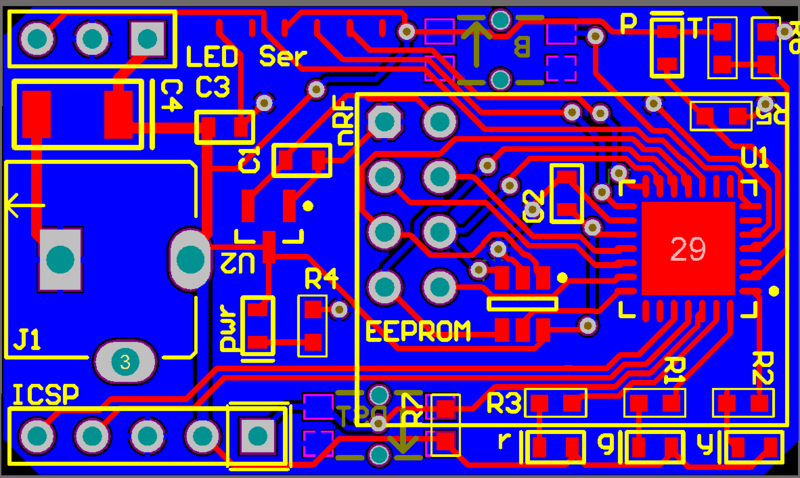 Here is the populated board. This board helped tremendously as far as getting the kinks worked out of our nRF code due to the increased stability afforded to us by soldered connections. 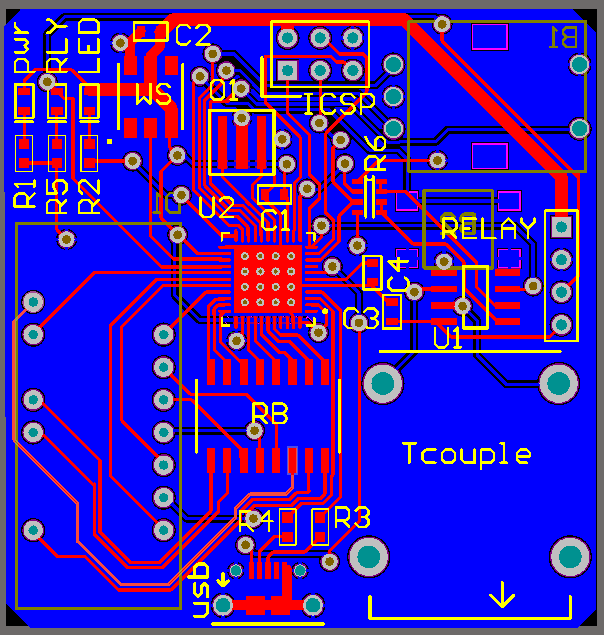 A good number of the flakey behaviors from the breadboarded solution disappeared when we moved to the PCB. 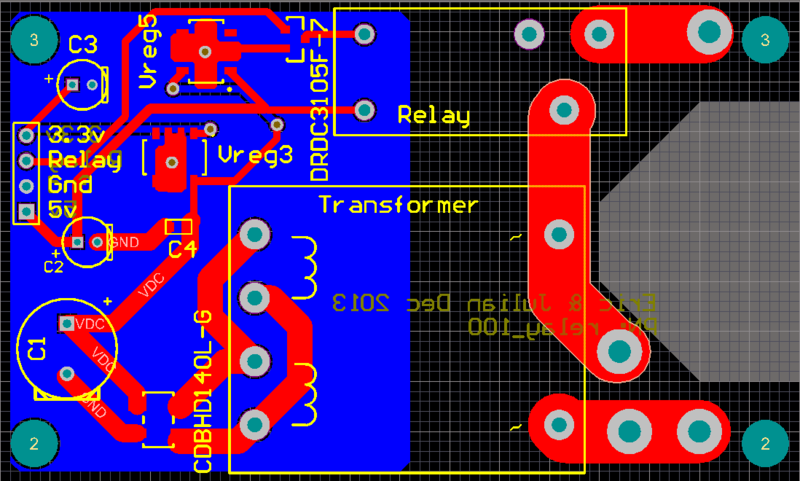 In my next post, I’ll continue filling in the missing pieces from the last few months including a few more circuit boards that Eric and I designed and had printed. If you’ve ever owned a hot tub, you’ve surely been driving home from a long day or night wishing that the hot tub would be ready for you when you got home. I decided to do something about this. 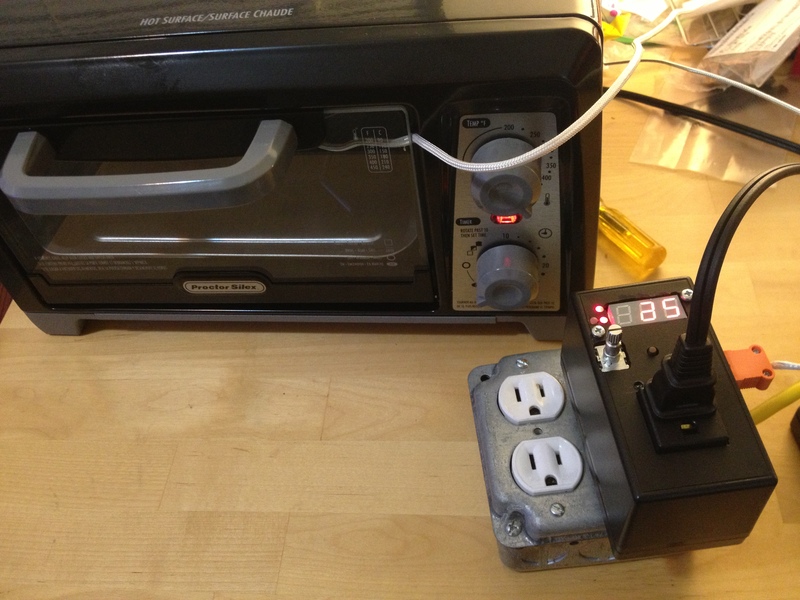 Because we’re renting, I decided that instead of trying to pull apart the wall unit for controlling the hot tub, I’d go with the more mundane approach of wiring up a servo to push the hot tub button on command. I chose the Electric Imp as my platform primarily because I’ve been experimenting with it recently for another project that I’m working on. Having worked only with PIC microprocessors before, I found the Electric Imp to be surprisingly intuitive and easy to set up and use. 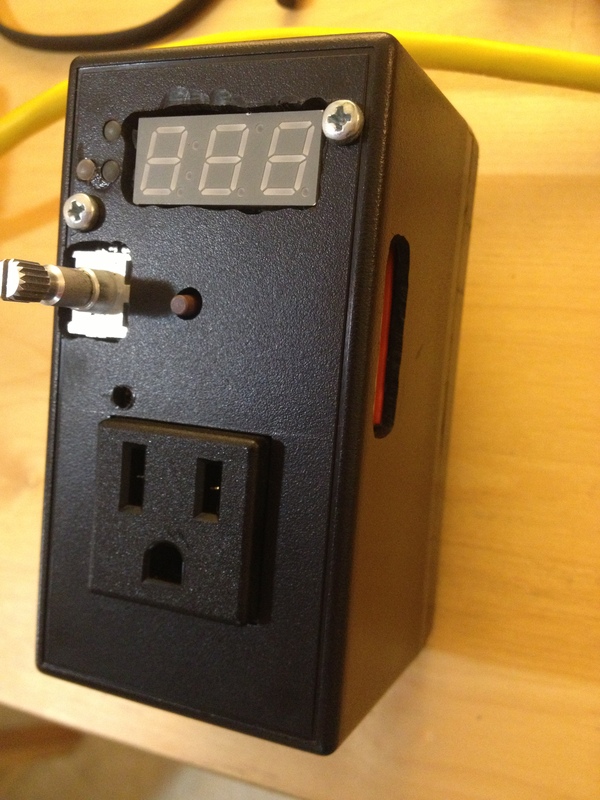 Instead of spending hours tinkering with a breadboard full of wires and a resistor or two, the Electric Imp fits easily into a development board, can be powered by a mini-USB cable, and configures itself to your home WiFi network without too much difficulty through a mobile app. The Electric Imp, once connected to your wireless network, is accessible via the Electric Imp web application that allows you to track all of your devices and upload code to each one of them as well as configure the way that they interact with each other. Once getting past some of the initial setup woes inherent in every tinkering project, the programming and wiring was very simple.